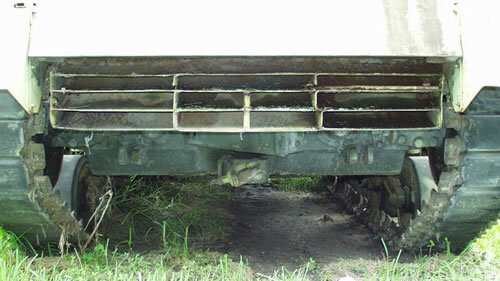 The main purpose of the deflector was to keep road dust down to prevent artillery from spotting moving tanks. This apparently wasn't perceived as a problem until the tanks got into combat, hence the early Sherman designs (M4, M4A1, M4A2, and M4A4) lack deflectors and later revisions all had them. 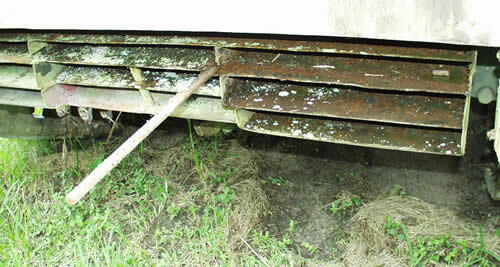 It appears the lever that swung out from the center of the grill was used to maneuver the deflector up and down. It was either folded up and propped out of the way to access the engine, or it was folded down. The basic Tamiya part (B42) found in the M4A3 kit suffers from excessively thick sections. 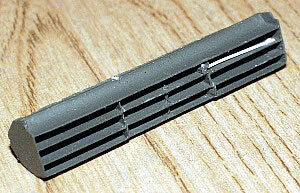 The advantage to using the kit part is that the interior curve of the louvers is captured. 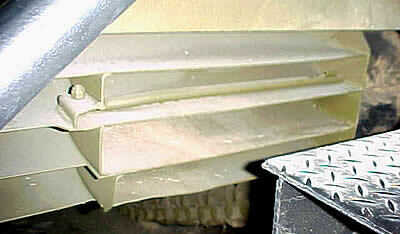 The quickest solution to a decent looking deflector is to thin the plastic louvers down until the have the appearance of the sheet metal used on the real deflector. This shows what is wrong with the kit part, and why the decision was made to modify it rather than build a new one from scratch. 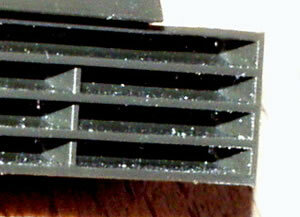 The louvers are extremely thick, nearly 3/4 of a scale inch, and look it. The part does have the advantage of actually having the curved inner surfaces of the real deflector. A simple thinning operation all that is really needed. The next four photos are of the Ft. Knox M4A3 75mm wet stowage tank, shot by Mike Foncannon. An excellent shot of the prop. The clip is barely visible at the far end. 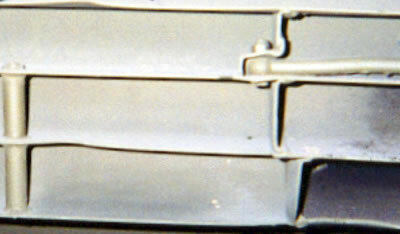 Detail of the prop knuckle and the deflector construction. Right side shot of the deflector showing the pivot. 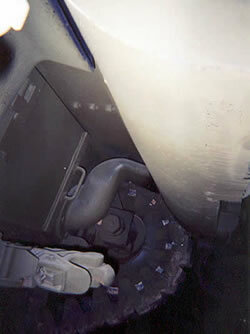 Underneath the rear hull plate from the left hand side. 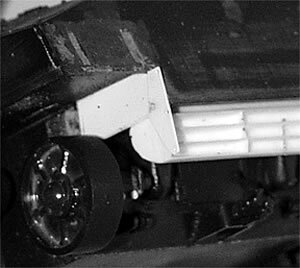 The plastic Tamiya part would look like this after a rework. The four stages from unmodified part (lower right) to finished casting (upper right) are shown here. 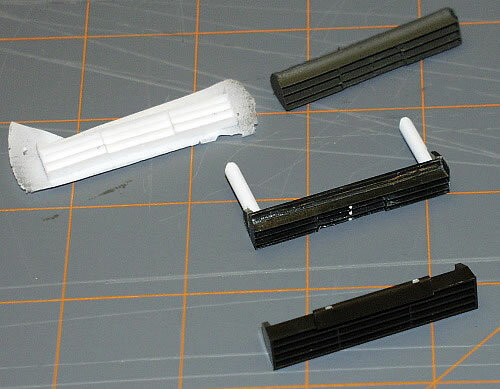 After thinning down the very thick sections, a mold was made and the castings were used for models being constructed. The finished resin casting with the prop added. The cast part as installed on the Tamiya M4A3. 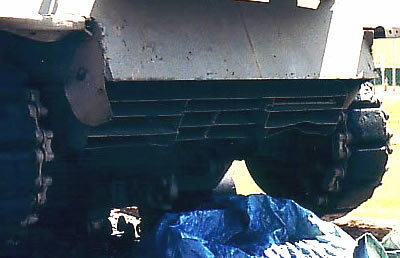 The kit is missing the rear sand shield support and the plate between the rear hull plate overhang and the lower hull rear. 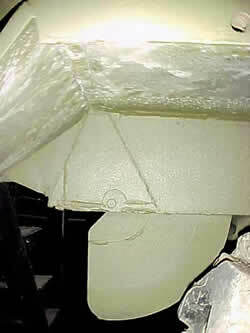 A fairly banged up deflector on the M4A3 at Ft. Snelling.